I love the set up of the room and the friendly people. Everything it was worth the money we spent nice, friendly, quite. Things were conveniently close and not hard to find. Def will be returning next year. I like the updated facility and clean accommodations. The location is easily accessed, not on a major route. It's very quiet. There's an occasion family with children but mostly retired folks enjoying the place. Best location that I have ever stayed. Will return in future. Great value for money. 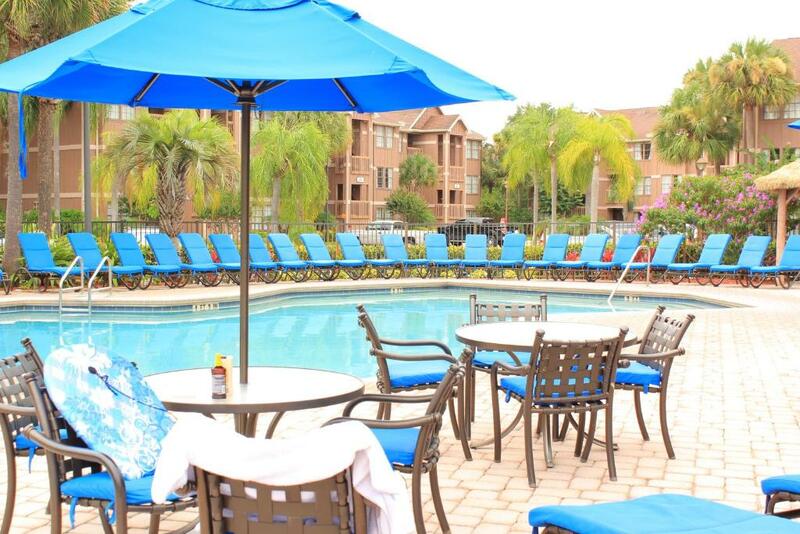 Close to all Orlando are attractions. My family has been going to Polynesian isles since the early 1980’s. It is always a great rxperience! The welcome home feeling was amazing as always. Then when we got a early check in after driving 6 hours to get there was such a blessing. We have been going there for over 4 years and will continue. Lock in a great price for Polynesian Isles Resort By Diamond Resorts – rated 9.3 by recent guests! Polynesian Isles Resort By Diamond Resorts This rating is a reflection of how the property compares to the industry standard when it comes to price, facilities and services available. It's based on a self-evaluation by the property. Use this rating to help choose your stay! One of our top picks in Kissimmee.Located in Kissimmee, Polynesian Isles offers luxury accommodations 4.5 mi from the Walt Disney World Resort. Lush landsaping, waterfalls, and lakes surround the resort. Heated pools are offered for guests to enjoy. Featuring a balcony, all units include a seating area with a TV. A kitchen with microwave and refrigerator is offered. There is a private bathroom with a bath in each unit. A fitness center, tennis court, and basketball court are offered. BBQ facilities and a picnic area are included. Hot tubs are available for guests to relax in. Polynesian Isles is located 7.1 mi from SeaWorld Orlando. Universal Orlando Resort is 13 mi from the property. When would you like to stay at Polynesian Isles Resort By Diamond Resorts? Features include a full kitchen, a private balcony, cable TV and a separate sitting area with a sofa bed. House Rules Polynesian Isles Resort By Diamond Resorts takes special requests – add in the next step! Polynesian Isles Resort By Diamond Resorts accepts these cards and reserves the right to temporarily hold an amount prior to arrival. Carpet is a little dated... other than that... everything was awesome ! The cops pulled over someone and arrested them in front of where we were staying but you all had no control of this. How smalll the pup gold was. Be prepared for them to sell you a time share. Don’t do it. It is a rip -off. The property and amenities are very good. Update the units, Clean up better - have tubs that actually have jets. Put the washer and dryers inside the units. Clean off the remote controls. Get newly updated mattresses. Provide turndown service without it being requested for customers who stay an entire week. I was immensely disappointed, the excessive fees for the stay were not worth it at all. I have stayed at other Wyndham properties, Sheraton resorts, even Marriott resorts and the least expensive of either would have been better than this property. The mattress was horrible and the carpet was smelly. We paid over $2000 for 2(2 bedrooms) and I could have paid that amount elsewhere and be a whole lot more comfortable. The bathtub did not have any jets (what's the point then?) Very disappointed -- telephone was broken. Television was not clear - the remote control felt greasy. They provided plastic cups (tasteless) When we entered the property the sofa coach was out and we had to make it up ourselves. We will never stay at this property again. We purchased their Timeshare and have canceled within the allotted time. I will not pay thousands of dollars for properties that are subpar. I will also share this information with our friends and family. This was very disappointing. We planned for this trip for months! Only one family member could shower at a time and we had to wait for the water to warm in between showers. Inconvenient for a family of 5 with small kids. I wish there more activities on site for kids. The door to the bedroom was squeaky and the sliding door into the bathroom was difficult to shut. However neither of these issues were major to us. The staff did not communicate with me that my family would not be assigned a room next to ours. The condo had been newly renovated.